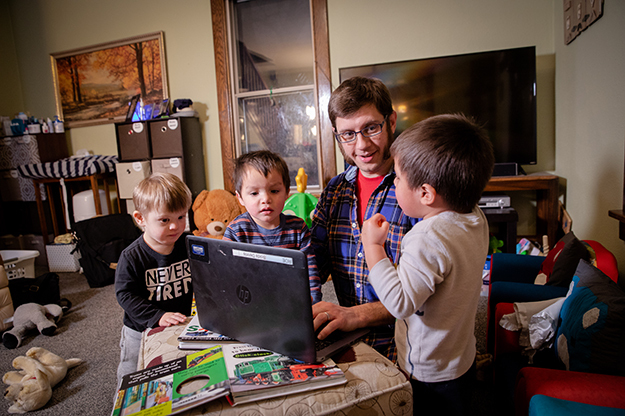 Special education teacher Den Bolda found the flexibility of UND’s online master’s program beneficial as a father of three young boys. Photo by Jackie Lorentz/UND Today. Amid bean bags, low tables, bookshelves, whiteboards, posters and maps, there is a vintage lacquered school chair with a writing pad. Den Bolda, special education teacher at Fargo North High School, often perches on it as he guides some half a dozen students through daily homework assignments, study plans and reading lists. Years ago, when he reached fifth grade in his native Chicago, he might have had a similar chair to prop his books and blithely cover them with doodles. Diagnosed with Attention Deficit Disorder, young Bolda would only cease scribbling when silence settled in the classroom. Was there a question to answer? An assignment to complete? He would not know. He paid no attention. Bolda realized his passion for the field as a school paraprofessional, initially in Chicago and later in Fargo. He saw children grapple with academics and emotions and choices. So had he. Albeit he knew little, at first, about learning and other disabilities, he thought he could help them. 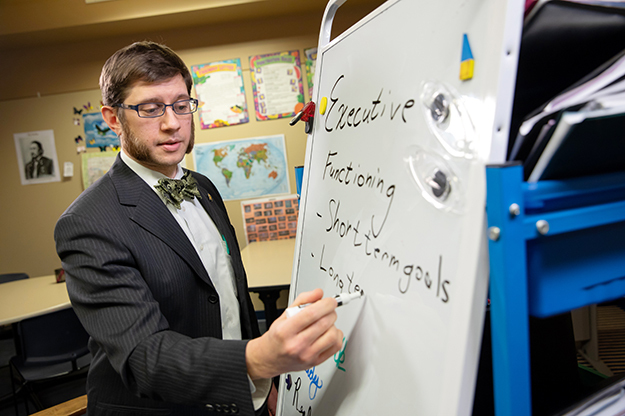 UND Assistant Professor Amy Jacobson, Bolda’s mentor, notes he was as good a student as he is a hard-working and dedicated teacher. Jacobson said that Bolda’s coursework at UND was consistently exemplary. Photo by Jackie Lorentz/UND Today. 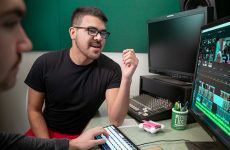 Bolda’s passion led him to the University of North Dakota, where he enrolled in the online master’s program in special education after a chat with UND assistant professor Amy Jacobson, who leads the resident-teacher track. 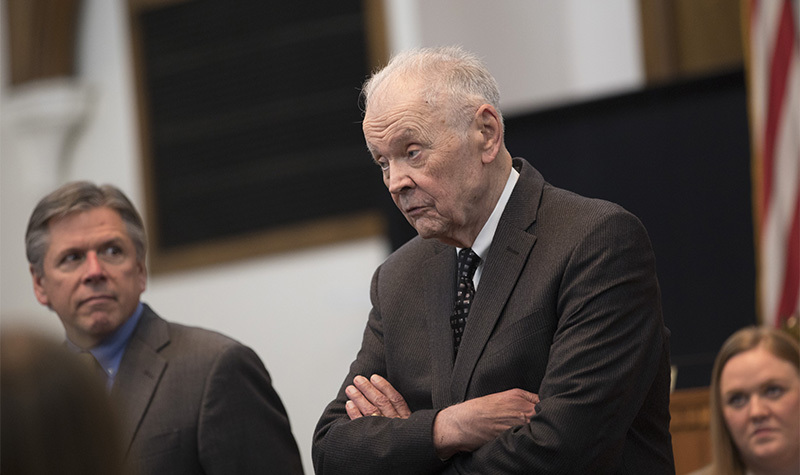 She became his UND mentor through the three-year commitment, comprising full-time teaching obligations and remote classes. The curriculum proved tough but the flexibility of an online degree benefited Bolda, who excelled despite shattering personal misfortunes. Bolda and his wife, Megan, lost two babies while he pursued his graduate studies. Doubting they would raise kids of their own, they began the rigorous process of adoption, which lumped more duties onto Bolda’s schedule. Toward the end of it, when they were to welcome twin baby boys, the Boldas were expecting once again. Within six months, they had three sons – Tommy, Robbie and Teddy. Bolda got his UND diploma, too. 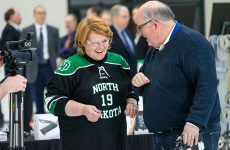 “I would say my education at UND through the special education program has given me great tools to help my children blossom,” he said. That’s because Bolda is not only a teacher of kids with distinct learning needs: he is a father of three. Tommy suffered from a congenital heart condition. His twin brother, Robbie, was born with arthrogryposis, an ailment that doctors expected to leave him paralyzed. And Teddy, the Boldas’ biological child, has Down syndrome. Two years later, Tommy’s affliction had disappeared. Robbie not only walks; he runs. Teddy, among other things, feeds himself with a poise remarkable for any toddler. They still have therapy – and even surgeries – to undergo and a lot more to overcome, but their miraculous progress elates the Boldas. In his home and at work, Bolda’s occupation, prompted by his own childhood troubles, has garnered a new crux, an essence of vocation.